Assalamualaikum wbt 2016, may you be good to me. Jika dahulu saya katakan 2015 suasananya panas, dan 2014 suasananya sejuk, tahun 2016 pula adalah peralihan. Come to think of it, actually the way I sense it, is almost related to the earth temperature itself. In 2014, there were floods, a big ones and multiple waves following after another and there were also cold phenomenon during those time. In 2015, I feel it will become really hot, and it eventually it does. Although I did feel it started before the haze started from neighboring country, it continues through out the year and it comes to the end with no major flood reported at east coast of Peninsular Malaysia that was supposed to happen every year. So true, isn’t it? in 2016, I perceive, there are a few things that might be change (in temperature and) to my life progress which I didn’t really know what is it (it give me scary feeling), but I choose to wait and see really carefully. 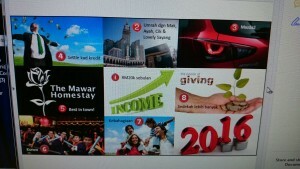 So, may everything goes smoothly this year and InsyaAllah things will be better. For me, the major changes this year probably moving from Putrajaya to my new house that cut almost half of my salary every month as for now. :p So, I should be ready to adapt and will initiate some plans to reduce the ‘casualty’ (omg) mentally and financially when the change take place.